Don't let the Pro eCigarette's advanced features and premium metallic build quality intimidate you. Even with all the added extras, the Pro is easy to use; In fact, just as easy as the iBreathe Starter eCigarette Kits. It still incorporates the traditional iBreathe one-button control - used to switch the eCigarette on & off, and also to vape - that's all! And with unrivalled power & vapour production in its class, it's clear why we call it the iBreathe Pro. Its double-sealed liquid chamber provides extra protection against leaks and the entire tank is disposable. This provides the convenience of not having to change the atomiser regular intervals. 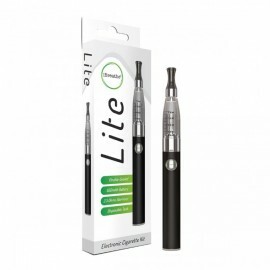 Its single button battery combined with a disposable tank makes the iBreathe Lite the simplest & most convenient electronic cigarette available. Disposable - Simply replace with a new tank. 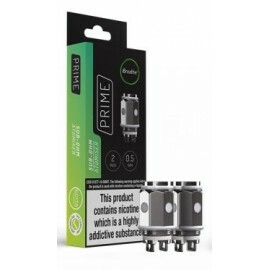 Made from the highest quality stainless steel & organic Japanese cotton, the Prime atomiser coil provides the highest level of e-liquid absorption that will ensure your e-liquid tastes its best. To make sure you get the most from your Prime e-cigarette, replace your atomiser coil every 2-3 weeks. Designed with simplicity in mind, the iBreathe Prime Kit delivers an exceptional sub-ohm vaping experience. With its one-button functionality, it is easy-to-use and maintain. 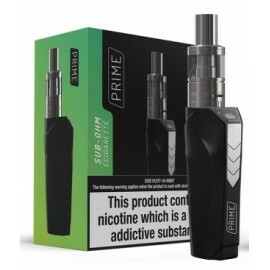 Equipped with an optimum fixed power of 50 watts, the Prime Kit produces great flavour and maximum vapour. Our Mango Slush Premium e-liquid shows that our back-room of vaping mad scientists have only begin to explore all the flavour combinations that are possible. Mango Slush features a classic PG ratio which is easy to inhale yet delivers the powerful throat hit and authentic smoking-sensation and nicotine load that so many customers demand. These flavours are not the same as the standard cartomizer flavours available from other suppliers. One Bottle of iBreathe Electronic Cigarette Liquid Refill contains 10ML of Fresh and Refined Liquid and is Equivalent to up to 100 Cigarettes. iBreathe specialize in crafting premium eLiquid refills with the highest graded and quality ingredients. iBreathe premium eLiquid Refills are produced using aseptic technique by professionals using only ingredients deemed safe for human consumption. All our iBreathe products are certified and compliant to CHIP, RoHS , MSDS, CE , CPT (Child Proof Safety)? .Our secret formula e liquid Ingredients are tested and screened for purity by UKAS laboratories using GC/MS testing methods. Grab yourself a BARGAIN!! Genuine iBreathe eLiquids from £1.50 a bottle! iBreathe e-Cigarettes Li..
TPD-Compliant Gum Gum 10ML - 70VG / 30PG - Cloud eLiquid Your favourite sweets from Bubble Drop ..
iBreathe Apple Flavour E-Liquid	The iBreathe Apple Premium E-Liquid offers a crisp and fruity vaping..
iBreathe Banana Flavour E-Liquid	A light and refreshing taste of the tropics, the iBreathe Banana Pr..
iBreathe Blueberry Flavour E-Liquid Like a blueberry muffin, without the calories. The iBreathe ..
iBreathe Bubblegum Flavour E-Liquid If you loved chewing bubblegum as a child, you are going to ..
iBreathe Cherry Flavour E-Liquid A sweet treat for fruit lovers, the iBreathe Cherry Premium E-Liq..
iBreathe Cola Flavour E-Liquid Just as refreshing as a glass of ice-cold cola, the iBreathe Cola..
iBreathe Cola Slush Flavour E-Liquid	Our Cola Slush Premium eLiquid is a new take on the classic col..
iBreathe Grape Flavour E-Liquid The iBreathe Grape Premium Liquid is a sweet and juicy e-liquid ..
iBreathe Orange Flavour E-Liquid Sweet, tangy and the perfect way to start your day, the iBreathe ..
iBreathe Passion Fruit Flavour E-Liquid	Bursting with tropical tastes and rich fruity aromas, the iB..
iBreathe Peachy Punch Flavour E-Liquid Peachy Punch is a high quality, Premium eLiquid with a ..
iBreathe Pineapple Flavour E-Liquid A brand new addition to the iBreathe Fruit E-Liquid collec..
iBreathe Raspberry Flavour E-Liquid Fragrant and full of rich fruity flavours, the iBreathe Rasp..
iBreathe Red-B Flavour E-Liquid Something a little bit different, iBreathe Red Juice Premium E-..
iBreathe Strawberry Flavour E-Liquid A timeless classic, the iBreathe Strawberry Premium E-Liqu..
iBreathe Tutti Frutti Flavour E-Liquid A delightful blend of tropical fruits, the iBreathe Tutti..
iBreathe Vanilla Flavour E-Liquid With its inimitable soft, sweet fragrance and intense flavour,..
iBreathe Watermelon Flavour E-Liquid The iBreathe Watermelon Premium E-Liquid is one of the most..
iBreathe Wonderberry Flavour E-Liquid The iBreathe Wonderberry Premium E-Liquid offers a vape fu..
TPD-Compliant Strawberry Haze 10ML - 70VG / 30PG - Cloud eLiquid An exotic blend of tropical fruit..
TPD-Compliant 10ml High PG Premium eLiquid - M Tobacco Our Mango Slush Premium e-liquid show..
iBreathe Premium Liquids 5 Bottles of your Choice. iBreathe e-Cigarettes Liquid Refills are sur..
iBreathe Premium Liquids 10 Bottles of your Choice. iBreathe e-Cigarettes Liquid Refills are su..
iBreathe Premium Liquids 20 Bottles of your Choice. iBreathe e-Cigarettes Liquid Refills are ..